My goal for today was to make the final border for the Floral Pet quilt. 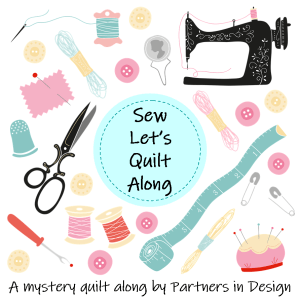 I reviewed two of my latest resource books for ideas, Collaborative Quilting and Collaborate Again by Gwen Marston and Freddy Moran. In the Parts Department segments of these books, there are many examples of blocks that can be used to make unique borders. I had enough of a floral Kaffe Fassett fabric to make a solid strip border. I thought it didn’t add anything to the quilt top. I wanted some black with white fabric to be placed next to white with black polka-dot border, in order to tone it down. I have enough of three different types of black and white fabric, that have already been used in the framing strips around the pets. At first, I tried a four patch square on points. I liked the angle, but thought it might be too small. Then, I tried just a four patch block with black and white blocks included in block. I was thinking of adding the blue floral for the corners to make the four block on point. The blue did not do much for the white and black polka dot border. I tried just a simple four block, but this seemed “too square”. It did not add anything special to the quilt top. Next, I tried a four square on points, using a black and white fabric for the corners. This was a bit too large, but I trimmed it down (not shown in photo), and I think this might be the border I use. I made some four squares. If I do not use them for this quilt, they will be used in some other project. I am working with scraps that were left over from a quilt that I made for one of my daughter-in-laws. I think turning these scraps into a border is assuring that this pretty fabric does not go to waste. Quilt that I made for my daughter-in-law. This definitely has been a thinking-kind of day. Thanks to Melanie at Catbird Quilt Studio. I have been using the Project Process she posted on her blog. It has really been helpful. I also want to give a shout out to my sister, Emma. I bugged her all afternoon. I kept sending her photos and asking questions. I appreciate her input. Esther Cohen and Claudia McGill. Their poetry has inspired me to write poems again. Also, my sister Emma introduced me to a group of poets who write custom poems for people. These poets published a book of their poems , typewriter rodeo. In this book there is a poem, Spare Hair, written about my sister, by Kari Anne.This past weekend, Emma attended a workshop presented by these typewriter poets. Last night, in a phone conversation, she shared some of the valuable information she learned at this workshop. A year ago, I purchased the pen fabric from Spoonflower , with the intention of making something for Emma. On Saturday, I finally put the fabric to good use. I made a notebook pouch and a pen pouch for Emma. They are in the mail today. For the larger notebook pouch, I again followed the tutorial by Alanda Craft. For the smaller pouch, I followed the tutorial of Jenny Doan. Yesterday, I started to play around with the smallest pieces of scraps. I had meant to throw them away. Instead, I began making mini-prayer flags. It was something to do as I watched a series on Prime that has gotten my interest. The series is Dickensian. Since I am bingeing on the series, I kept busy by making more mini-flags. There is something rather relaxing in making things by hand. I especially like making little things. My sister, Emma, says she prefers making Quick Art. I never thought of it as Quick Art, but now I do. I think I enjoy Quick Art because of the immediate reinforcement in seeing a completed project. Also, it is just fun to cut and sew. It has been four years since I retired. My last class of first graders that I taught in 2014, are headed to middle school. This morning, I attended the celebration for these precious fifth graders. It was great seeing the children and their parents. Lots of hugs and smiles. The ceremony was student-led. It was impressive to see how the students presented themselves. They were articulate and inspirational. This group of students has always been creative, energetic, and outspoken. I am so very proud of them. I definitely know there are big things ahead for them. As I left the school parking lot, I was blubbering like a baby. My husband said it has taken me four years to fully retire. I agree. There is finally closure. When I arrived home, I found this package from my sister, Emma. She is the artist and illustrator in the family. Emma introduced me to Gelli-printing, and to the artist, Mark Hearld. Emma shared some of her work with me. It has been quite an exciting and emotional Thursday! My sister, Emma, always encourages my endeavors. She is a great source of inspiration. Emma is enjoying a small vacation, and she sent me two short videos of snails. I made a short video and created a stitch meditation based on the clips my sister sent to me. It’s been raining all day, so I decided to pull out the Gelli-Art Plates and have fun. Well, this project turned into ONE BIG MESS! I have viewed so many tutorials, where using these plates seems so easy. Many of the tutorials say to play and just have fun. My goal today was to try different fabrics and papers to see what I liked best. One of my problems with printing, is…I do not know when to stop. I keep adding paint until something that started out with potential, ends up looking murky. I was trying out different home items as tools for printing. I found some I like, and some that I can do without. In the middle of all this mess, I went to wash my hands and discovered that the water had been turned off. I went outside to find a city crew, working in the rain, trying to fix a pipe problem. So, I will have green hands until about three o’clock today. I am learning what works and what doesn’t. I am having fun a “good day that is funny” and MESSY. I could start a Pinterest Fail page with this piece. This murky piece started out pretty and ended up like cream pea soup. There is supposed to be a ghost imprint of a tree. When this dries, I might try some thread sketching to see if I can salvage this practice piece. This fabric piece came out sort of okay. I might try to applique or thread sketch on this one also. That is supposed to be a bird in the middle. I shared these pieces with my sister, Emma. She was the one who got me interested in Gelli printing. She has made some fantastic art with her plates, and she has just started. Her advice was not to give up. Here I am, taking advice from my younger sister. Shouldn’t it be the other way around? I am done for the day, due to the no-water situation. Back to viewing more tutorials. Yesterday, I set a goal to not start anything new until 2018. It took me one day to fail at this goal. So, I guess my answer is…Some goals are met to be set aside. I started working on a WHIMM, (Work Hidden In My Mind). For the past few days, I have been looking online for tutorials, photos, and videos on how to make fabric journals. My interest in keeping journals, plus by love of trying new things, just made it a natural thing for me to try my hand at making a fabric journal. I have seen more photos than tutorials or how-to’s, so I am really jumping into this with only my interest and a willingness to try something new. Since Pantone chose my favorite color, purple, to be the color of the year, I pulled out some fabric from my stash. Thanks, Mary (Zippy Quilts )! Your post about Pantone inspired me and got me started. Like I said, I really don’t know where I am going with this. I once took a class on making book journals, so I think I can figure out how to sew the segments together. This is going to be a gift for my sister, Emma. She is the artistic one in the family. Emma has written and illustrated five children’s books. She keeps the coolest journals. One year, I gave my siblings a personalized journal as a Christmas gift. I told them it was a selfish gift, because I wanted them to keep the journal all year and then give it back to me. Only Emma returned the journal and it was fantastic. I could see her daily thoughts and activities through her fabulous illustrations. This is the first square I made for the journal cover. I made my own fabric, and I hand quilted it. I am not quite finished with this one. Some of the fabric included in this block is from the pieces my brother sent me from his furniture design company. For the next block, I will be using embroidery thread. In a previous post, I mentioned that my mom had seven sisters. All of the Martinez Sisters were very talented and crafty. Their skills and talents included one or all of the following: knitting, beading, crocheting, quilting, sewing, painting, drawing, cross-stitching, and embroidery. My twelve female cousins and I were fortunate to grow up watching these women produce such beautiful products. Many of us are trying to carry on the tradition. There is one cousin, Judi, the daughter of my Tia Pilar. We keep in touch and share projects. Judi is also so supportive of my efforts. When we were younger, Judi came to live with my family while she attended college. I thought she was the coolest person around! We called our aunt, Tia Pi. Tia Pi could do just about anything. She was also a great joker and prankster. She taught me how to move and dance like Elvis. Tia could even cut hair. On one of her visits, she gave me the “duck cut” which was all the rage in the 1950’s. Of course, that must have been popular in her hometown of Key West, Florida. It did not go over too well in San Antonio. Tia Pi’s paintings graced the walls of my mom’s house. I am lucky to have the one she painted of a Cardinal. I once watched Tia hand-quilt a baby quilt and I was so impressed. She also taught me some special crochet stitching. Judi does excellent work in beading, crocheting, and cross-stitching. She is now doing some sketching also. Judi shared some of her work with me today and I asked if I could post them. She said that I could if I noted that she is “a jack of all trades and master of none”. There. I said it. But it is NOT true! I don’t know if you can see the beading on the red and purple flowers. Mom would have loved this. I think it is time to pull out my charcoal pencils and have fun. You can see that Judi and I share the “working-on-multiple-projects-at-one-time syndrome”! Judi, like her mom, is one talented and creative person. I’d also like to share an art doodle my sister drew the other day. Emma is the author and illustrator of What This Story Needs is a Pig in a Wig series. Emma was thinking of our childhood and sent me this art doodle concerning the eight Martinez Sisters. A chancla is a slipper. When any of us ever even thought of getting out of line, the threat of “La Chancla” was enough to straighten us out. I never saw or experienced “la chancla” being used. The stories about La Chancla were enough to keep me in line. This is my sister’s art doodle…TheChancla Constellation. Now, I can look to the sky and think of the Martinez Sisters.